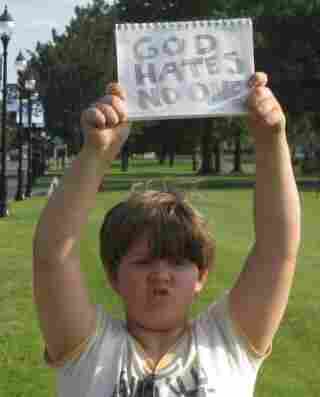 9-Year-Old To Westboro Baptist Protesters: 'God Hates No One' : The Two-Way Patty Akrouche says she's "never been prouder" of her 9-year-old son, Josef Miles, than she was this past weekend. He quietly rebutted the infamous group's anti-homosexual protest. Patty Akrouche says she's "never been prouder" of her 9-year-old son, Josef Miles, than she was this past weekend. As Akrouche wrote on her Facebook page, she and Josef were on the campus of Washburn University in Topeka when they encountered some of the protesters from the tiny Westboro Baptist Church, which has gained notice in recent years for protesting against homosexuality, abortion and other issues outside the funerals of military veterans and celebrities. Another view of Josef during his counter-protest. 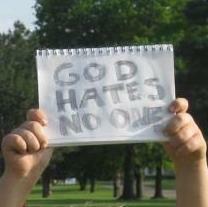 Westboro's followers are infamous for their signs that — using an F-word we won't repeat — say "God Hates [Homosexuals]." For his quiet counterprotest, Josef has gotten noticed too — for example, by The Huffington Post and The Topeka Capital-Journal. So, Buzzfeed may need to update its "30 Best Anti-Westboro Baptist Church Protest Signs" page (note: some images there do have words we wouldn't use).